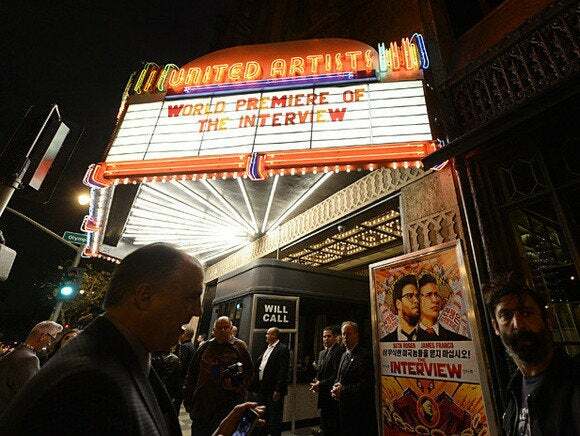 On Tuesday, the group responsible for the attacks on Sony Pictures made threats against the studio, and the theaters planning to show Sony's film, The Interview. Reacting to the message, Sony canceled press engagements with the film's stars, and 24-hours later, the largest theater chains in the U.S. announced screening cancellations. Update: Sony Pictures has canceled the December 25 release of The Interview. Full statement below. Regal Entertainment, AMC Entertainment, Cinemark, Carmike Cinemas and Cineplex Entertainment (the largest exhibitor in Canada), have all said they are not going to show the film, set to open on Christmas Day. After the threats were made, there were reports that Sony refused to yield, but studio also told exhibitors that they would support any decision made. The threats made by GOP are thin, but they were enough to trigger a fresh wave of media coverage on the Sony Pictures hack, and enough to make the five largest movie chains in the country walk away. Sony's nightmare just won't end. But this latest development makes things worse for everyone. The theaters have to protect their patrons and their business interests. So in a way you can't fault them for canceling the showings. While I understand why the theaters had to cancel, I still feel as if it was the coward's way out. And yet, despite that, I can't say I would have done something different. On the other hand, this sets a terrible precedent. Now, any criminal can make similar threats, and it's almost certain they'll get the same results. I still stand by the prediction I made on December 2. This case will have an insider element and nothing to do with North Korea – no matter how bad the media wants it to be true. As I wrote then, this breach is more than just a simple IT issue; it's touched each business unit within Sony Pictures. Thanks to this, shareholders are going to take a long look at things. It was bad enough when movies were leaked, now the box office returns are impacted. Furthermore, people who worked on that film, and get a cut of the box office take, that money is gone. In conversations with various insurance experts, I've been told that anyone with ties to box office earnings could sue if this hack impacts their paycheck. Two ex-employees are suing Sony Pictures over this breach, and now Sony has to deal with HHS because there were possible HIPAA violations. Their network, by and large, is still offline and only barely functional (according to employees who have spoken to me), and isn't expected to return to a normal state until later in January or early February. There's serious doubt that the cyber insurance policies held by Sony are going to cover this, assuming they pay out at all. But the precedent bothers me. That threat was thin, and there is only circumstantial evidence proving it was actually authored by the attackers. But that doesn't matter, the damage is done, and the theaters are likely going to stick to their guns and refuse to show the film. It's in their best pro-active interests to do so. This won't be the last time empty threats are used. Now that it's been proven to work, we're probably going to see this two or three more times in 2015, before crying wolf is no longer a viable option. But each time it does, the cost of the incident (financially and mentally) will only climb.